What’s wrong with Kiwi pitch curators? One of them messed up the Bangalore Test against Australia. And now this graveyard got dished out. Apart from perhaps Yuvraj Singh in India’s 1st Innings, every other batsman got himself out. The pitch had nothing to do with them getting out (for most part). After the recent spate of huge scores on boringly dead tracks, this is hardly an advertisement for Test cricket. Yes, this Test match was quite gripping stuff. But this was more due to bad batting in the 1st Innings by India than anything to do with the pitch. Once a team puts on 619 runs in its first innings, the other team is always going to play catch up! And that’s precisely what India did. To compound matters, in the first innings reply, Sehwag, Gambhir, Dravid, Tendulkar, Laxman, Karthik, Harbhajan Singh and Zaheer Khan got out to poor shots, while Yuvraj Singh played like only he can! The response from India, after following on, was solid. It was expected. It wasn’t pretty. But it was necessary. Now India have the opportunity to go back home (or to South Africa, to play in the IPL) with the silverware. I do not expect to see any changes in Team India other than Dhoni coming in for an out-of-colour Dinesh Karthik. I would also hope/expect that Dhoni will hang up his soccer boots! Meanwhile, we have the start of what appears to be a bit of a controversy with Rahul Dravid appearing to question either Virender Sehwag’s shot selection or V. V. S. Laxman’s justification/defence of Sehwag’s shot selection! Either way, Team India should work to put this Test match and the soccer ball behind it and move on to Wellington where the 3rd Test commences on Friday. At the end of the 6th over of the ongoing Test match between New Zealand and India, New Zealand was travelling nicely at 21/0. The 7th over was a beauty from Ishant Sharma. He had Macintosh out first ball and almost had How out LBW off the 5th ball. At the other end, the 8th over was a terrific follow up from Zaheer Khan. He had How cleaned up off the last ball and New Zealand was 22/2. At this crucial juncture, in the 9th over, after his team had taken 2 wickets in 2 overs, Sehwag decided to bring in Munaf Patel! It wasn’t as if Ishant Sharma was spent! For crying out loud, he had just taken a wicket in his previous over! Dinesh Karthik found himself back in the XI today after Dhoni was ruled out due to a crook back. Dhoni’s shoes are a bit big to fill at the moment, but I do hope Karthik does well with both bat and gloves – we do need a good reserve ’Keeper. I was reading a small blurb in The Age a couple of days ago on how Brad Haddin had been conceding a lot of byes and on a list of Australian Wicket Keepers who had played 15 tests or more, he was ranked 3rd (averaging around 6.2 runs a test). Who do you think tops the world wide list? Dinesh Karthik at a whopping 8.3 runs a test – and he had just played 14 tests (as a Wicket Keeper) then. 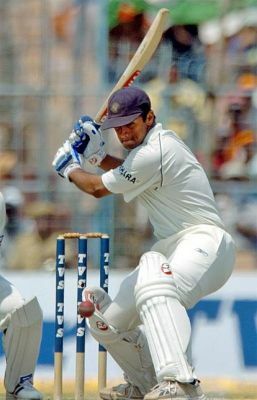 Playing in his fifteenth test today (as the designated ‘Keeper), Karthik has already managed to concede 6 byes – that too by lunch time on the Day 1. Not a good sign. Is India capable of hosting major events? The second edition of the IPL will now be played at South Africa. And as always in India, I feel the Indian public have been robbed. The success of the first edition of the IPL was mainly due to the people — the crowds that filled the stadia — that made the event. Almost every match had full crowds and they loved it. Towards the end of the tournament, even staunch cricket non-believers wanted to go and “soak in the atmosphere of the IPL”. And now, instead of Delhi, the people of Durban will wonder what the fuss is all about. Instead of Jaipur, people at Johannesburg will wonder why their hotels are suddenly booked out with able-bodied men in lycra! Instead of Calcutta, the people of Cape Town will wonder what’s going on in their somewhat empty cricket stadium. Yes. The IPL will be played in South Africa. It will be shortened by one week and will start on 18 April instead of 10 April. Shane Warne gets his wish for a shortened IPL. It may also be played in front of somewhat empty stands — I somehow can’t see too many South Africans rolling up to see Asnodkar, Jadeja and Manpreet Gony! But don’t worry, millions of people in India will be glued to their TV sets! I will say it again, the people of India have been robbed… again… as we often are! In saying that, I think this was the right decision in the end. But I am not having an each-way bet! I’ll come to the main thrust of my article later. The tournament had to be played — these were contractual obligations that the BCCI has with franchise owners as well as to TV rights owners. These contracts with key stakeholders cannot ever be compromised. The show must go on. These key stakeholders invested in the IPL in the hope of making returns on their investment. Especially in these tough economic times, to cancel the second edition of the IPL would be a calamitous economic folly inflicted on franchise owners and TV rights owners. As investors, franchise owners have a right to ensuring that they get their returns as promised in their contracts with the BCCI. Ditto the TV rights owners who coughed up huge sums of money to buy the rights. Try getting these investors to tell their banks that they would be defaulting on their repayments for a year because all the country’s security folk were required to guard a few politicians! Moreover, the knock on effect on BCCI’s Champions League — which was already cancelled once due to 26/11 — would have been a needless double whammy. So the IPL just had to go on. The show must go on. After all, England came back to play Test matches in India just weeks after 26/11! The second edition of the IPL could not be postponed either. Given an incredibly packed international cricket calendar, this was not just the best period for the IPL; it was the only period for the IPL. This was the scenario that was presented to the Indian Government. The Government (Babu-dom) sat on its haunches as much of (what I call) “Old India” does. Babu-dom vacillated and ummed and awed and passed papers — in triplicate, no doubt, with appropriate challans marked by about 20 different people for about 30 different layers of Babu-dom to scrutinise and release ummms and awes. Meanwhile “Young India” decided to march on and take the baby along with the bath water to another country. Fair enough. The world waits for no one. And no one ought to be held to ransom. A week ago, given the stand-off between the BCCI and the Government, it seemed highly unlikely that the second edition of the IPL would take off at all. Given that dreadful scenario, for the tournament to now go ahead in South Africa is a terrific achievement for “New India”, while “Old India” sits on its fingers growing nothing more than ring marks on its backside. Now I realise in saying all of this that there were unavoidable circumstances at play here. There is a general election on. But surely, if a general election takes away the entire police force and security agencies of a country, then, you need to question its claim to host any major event! While it is not a question of “national pride” being at stake, I am convinced that questions must be asked of the security machinery in the country if the entire security apparatus is needed for running an election process. In saying this, I am in no way suggesting that cricket is bigger than democracy or security or due political governance. Not at all. So habitual flame throwers and angered souls need to read this disclaimer prior to picking up their keyboard! National elections must take precedence over a cricket tournament. One is an absolute necessity and the fundamental tenet of a vibrant democracy; certainly one that cannot and must not be compromised. The other is a mildly dispensable past time. Further, “national pride” would take a far greater beating in the face of a security breach — like the one we witnessed on 26/11 or in Pakistan recently — than it would by the tournament being conducted in South Africa. However, the question must be asked. Why do we need a mammoth police force (the largest in the world by some margin) and the army and an elite company of NSG commandos protecting a bunch of politicians? If we cannot answer this or answer this with a “we are like this only”, then we do also need to simultaneously question whether India is ready for “major events”. If it were Australia touring India or England touring India and the India coach or captain had said, “We need a typical Indian wicket where it spins from the first ball so it brings our spinners into the game against their batting attack which is not used to the ball spinning around a bit,” we would have had Lalor and Conn and “their types” licking their pens with juvenile and puerile pleasure. They’d have had a story to write about in which they would pillory said coach and/or captain! After all, did the the Lalors and Conns and “their types” not castigate and lampoon Ganguly for saying pretty much exactly what Moles did prior to a Test match in Nagpur a few years back? Steve Waugh, in his biography, compared Ganguly’s alleged interference to “match fixing”! So, do we now fix up Andy Moles for match fixing? I’d like Steve Waugh to write about this too if possible please? We haven’t heard a murmur yet on this Andy Moles pearl from the Team India camp. They just get on with the job and leave the whining to the Lalors and Conns and “their types”! Mind you. I do not have any problems with the comments of Andy Moles, just as I’d hope the Conns and Lalors and “their types” would have no problems with the hypothetical Team India Coach or captian saying “When in Sydney, expect to see the Opera House. If you want to see the Taj Mahal, visit India instead!”! IPL Tamasha to become African Safari! The Indian fan (or for that matter the Indian voter) was least on the administrator, the owner, and the politician’s mind when it came to making a decision on holding the IPL this year. It seems more or less certain that this year’s league will be played in South Africa. Little does it matter what the fan thinks. How bizarre is it to have the Indian Premier League played in another country. If Chennai Super Kings play in Capetown, are they now Capetown Super Tigers? And all of this for merely protecting the sundry Politician? Yes, all this drama regarding security is all about protecting the politicians during their campaigns. It has nothing to do with protecting the citizenry. Isn’t it still fresh in our memories that it took more than 12 hours for the National Guard to get to Mumbai during 26/11 bombings merely because they had to fly from Delhi where they were protecting the Politician. If it was truly all about security of the Indian voter, dare I ask why the government did not consider moving the elections by a month? After all what is more important to an Indian voter (I mean Indian fan), to see Tendulkar’s action or Varun Gandhi’s speech? Doesn’t “Action speak louder than words?” Does the Indian voter really know the make up of the first, second, third or the gazillion’th Front considering leading the country? I bet you the Indian fan knows the leader and the team make up of every IPL team. The Indian fan rather spend hours in line trying to get into Chidambaram stadium rather than waiting outside a polling booth only to find out that some one has already been gracious enough to vote on his or her behalf. And what do the results of the elections mean to the Indian voter anyway. The parliament tolerates the same old faces with the same old ideas only with a different set of friends and enemies. The country seems to be running fine despite the Politician’s presence. It does matter to the Indian fan if it is going to be Shane Warne or MS Dhoni who lifts the cup, it does matter if Abhinav Mukund becomes the new Yusuf Pathan of India. Shall we vote on it? And why are the Mallyas, Ambanis, and Zeintas gung-ho about having the IPL on whether it is in Mumbai or in Timbaktu. Their revenues are from TV commercials and that will come so long as their is TV coverage in India whatever the time of day the games are held. They are going to be there at the grounds watching the games in real time anyways. What difference does it make to them if the fans are Indian or Persons of Indian Origin. Same skin colour anyways. The money that counts at the end of every game is the money that matters to them. And, by the way, they are pretty excited that this might open up new markets for them. The IPL has become the biggest political corporation in the country. It will not be surprising if, based on the outcome of this year’s league, the IPL asks for a bail out from the government. No points for guessing who pays for all this! P.S: By posting this article, I certainly did not intend to take away the glory associated with the amazing victory achieved in New Zealand. Those are and will continue to remain the cherishable moments in Indian cricket for the fan and the cricketer. Tendulkar & Yuvraj started off with a flurry of boundaries off Martin & O’Brien, who were bowling a bit short. Tendulkar had come out with a different attitude. Day 2 was all about grafting and getting in. Today he was playing strokes at every opportunity. He got to his 42nd hundred pretty quickly but as Shastri pointed out he played & missed more in that period than all day on Day 2! Then the bowling tightened up, the length was increased resulting in a couple of maidens. Yuvraj then shouldered arms to a straight one from Martin coming around the wicket and lost his offstump!! Dhoni struggled early on with his timing but Tendulakr calmed him down while he continued his sublime batting form. Surprisingly Vettori took both bowlers after 6 overs each and the change worked in favour of India and they went to lunch with a lead of 100 with 5 wickets. The session to India. Soon after lunch, Dhoni started to play some shots. He did not look very convincing, almost got caught by Ryder but a couple of balls later was caught behind trying to hook a bouncer. This was not a wicket for really playing shots, unless your name ended with KAR 🙂 . By now, O’Brien was really pounding the ball in. Dhoni’s wicket spurred him on and he got a beauty to lft off just short of a good length to snort up on Tendulkar, getting the edge. Tendulkar had made 160 by then and India was 164 ahead. There was a bit of lusty hitting by Harbhajan. Surprisingly Vettori took himself off at this point and brought in Mills. While Mills picked up Harbhajan trying to drive on the up, his bowling continued to be pedestrian with Zaheer peeling of 16 from his next over. Zaheer continued in that merry vein taking India past 500 before Munaf was picked up. India scored about 130 runs in this session while NZ got 5 wickets. Even I reckon. The kiwis got off to a disastrous start with McIntosh nicking the second ball of the innings to Tendulkar. There seemed to be no doubt about the catch in the minds of the umpire or the fieldsman but slow-mo replays kicked off a lot of conjecture about the cleanliness of the catch. Guptill & Flynn settled down and the former played some lovely drives. The Indian pacers kept a full length and a tight line. It was tough test match stuff on a 3rd days wicket that did not offer much to the bowlers. But being on the slow-ish side the batsmen had to be cautious too as Guptill found out when he drove a bit casually at Harbhajan and was picked up by Sehwag at mid-off. Mills came on and I thought Dhoni missed a trick by not bring the quicks immediately back for him. He did bring Munaf back for the last over of the day and after tormenting Mills with 4 of the first 5 balls, Patel put him out of his misery by nailing him in front of middle & leg. With 3 wickets, India just edged out NZ for honours in that session.